I'm always interested to see what happens with the Linux market share on Steam, especially the bigger picture. Here's an alternative look at the Linux market share on Steam. Credit to GOL fan "hardpenguin" for his idea, to check on how the rise of "Simplified Chinese" as a market on Steam has directly affected the Linux market share. The results are—interesting. I should state that, while obvious to some, people still get confused by all this (especially me, I'm only human after all). We are talking about percentages, not absolute numbers. We have no idea what the real numbers are behind this, only the percentages Valve give us by surveying a set of their user base. 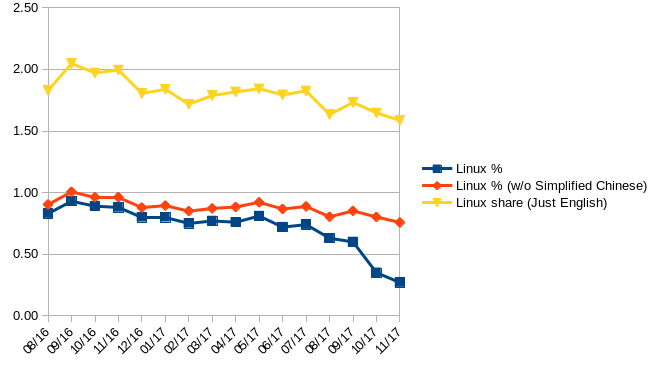 First of all, let's take a look at what's happened to the overall Linux market share as shown by Valve in their hardware survey. It doesn't look good, but keep reading after. 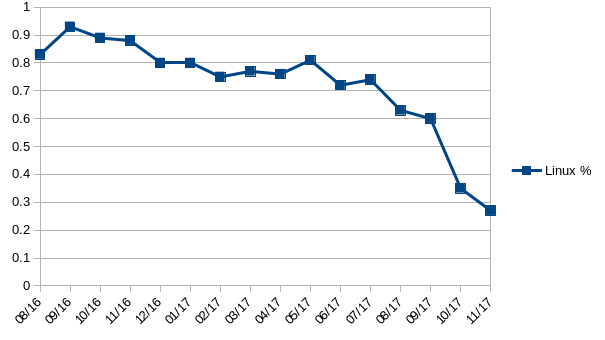 So, from our experiment here, it shows Linux is currently in a decline in terms of "overall market share" on Steam. No need to sugarcoat it or hide from it, the data is there. However, it's nothing close to how bad it may seem, given that you should obviously see how Simplified Chinese rising sharply has directly affected it, it's clear as day when you simply remove it. To mention an important fact, Steam is not just growing in Asia, as shown by Valve's own info. Before we get people looking at the lines without Simplified Chinese and thinking Linux is going down by itself anyway. It's just that Asia has grown more rapidly than others. It's quite clearly a Windows-orientated marked too, so even if Linux has actually grown during that time, it's just been massively outpaced. The point? It's not as bad as it seems. Something to keep in mind, that I’ve mentioned before numerous times: Steam is constantly growing. We don’t know what the true numbers are, so it’s literally impossible to get the real picture. As mentioned at the start, we just don’t know what the total amount is each time they do the Steam Hardware Survey in terms of the amount of people surveyed and the total amount of registered Steam users. The fact remains that a lower percentage for Linux one month, against a higher overall number of users, can end up as an increase in total numbers of Linux gamers on Steam. I'm not saying it is or it isn't though. For us to know if the real amount of people using Linux for gaming on Steam is higher or lower, we need Valve to release the actual numbers behind the curtains. Something many people have been repeatedly asking for. What will be interesting to see, is how Linux bounces back once the hype around certain popular games begins to fade. I don't want to repeat what I've already said too much, but it will happen. I imagine it will be at least a year before we see that happen and how far will Linux progress behind the scenes in that time to be ready? The open source Mesa drivers have come along at a staggering pace to improve AMD performance on Linux, decent VR supporting is slowly coming along, we've got games being released all the time and more. What we need to think about, is preparing for the bubble bursting back in our favour. This was an interesting way to spend a Saturday evening, I shall return to our normal Linux gaming news on Monday! Note: All this data was manually gathered and sorted by me, using the data available from Valve. Credit would be appreciated it you pinch it. I have not done much with steamcharts... is there a way to show total number of linux users? Or does valve consider that proprietary? I'm more surprised that Linux is not widely used in China. That's still not good, considering that China is the future biggest market. This chart means Linux is completely ignoring the Chinese market. Also, the non-Chinese market share is still going down. Quote What we need to think about, is preparing for the bubble bursting back in our favour. The bumpy ride isn't over yet, in fact it is just beginning. Nintendo are being very kind to indie developers and encouraging them to port to the Switch. Quite a few indie devs are aiming their sites on that platform down to it being much less cluttered store front and it's dual purpose as a portable device, perfect for games such as Stardew valley. The switch (is it linux based ? )even got AAA PC title Doom albeit with reduced graphics using Vulkan.. Linux not in sight. They are making bank and have a huge captive audience. This has been a problem for Linux ever since Consoles went X86 PC hardware and are now basically Windows/BSD PC's in a console case. Just as Linux/SteamOS was around the corner Devs were starting to look the way valve was pointing and then all of a sudden it became much more lucrative ( and easy down to better engine / middleware support) to develop for Consoles on a stable target platform.. press a button and export to 90million users without the need to learn a whole new console architecture like the old days. So with this in mind apparently Microsoft has some thing big planned for indie devs next year to compete. AAA game space is shrinking, even EA said so themselves. So there is Xboxone/xboxoneX , PS4/PS4k , Windows10, Switch, then for many devs Andriod & IOS.. Somewhere down the Line is Linux and it makes very little sense right now to really invest hard on the platform. Not pointless of course i belive it is growing but it is going to take some genuine support and marketing from Valve to get this moving again.. perhaps even decent GOG galaxy support. Who knows, with better drivers & VR, valve might make a SteamOS 2.
sarmad That's still not good, considering that China is the future biggest market. 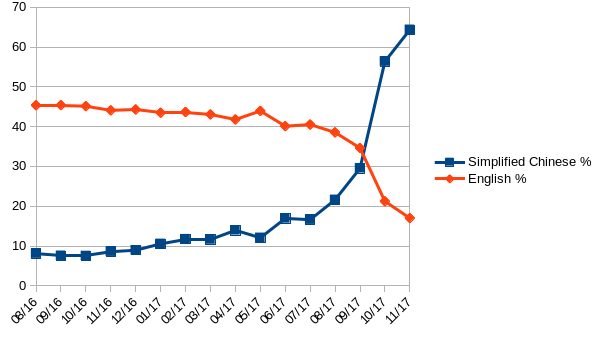 This chart means Linux is completely ignoring the Chinese market. Also, the non-Chinese market share is still going down. from what I've read in the past, it's more to do with how Chinese have not taken to Linux that well. many even down play Linux more-so with misinformation. In the last 5 to 6 years that view has been changing thanks to Android and a few developers that have been working on Chinese language for Ubuntu Kylin and the mostly Chinese developed distro Deepin. in order for Linux to be available for Simplified Chinese someone has to be willing to do the translations. plus China has been so ingrained to use windows that pirated copies of windows 7 runs rampant from what I've read in the past. I honestly don't know how much of that has been true. but considering that many don't have windows 10 yet, since it is a free upgrade, then they most likely don't have the MS genuine approval for the free upgrade. one thing that could flip windows on it's ear though, is if we could get more Linux adoption to China along with key games that are real popular in China ported properly for best performance. it's an interesting idea. neowiz73 plus China has been so ingrained to use windows that pirated copies of windows 7 runs rampant from what I've read in the past. I honestly don't know how much of that has been true. but considering that many don't have windows 10 yet, since it is a free upgrade, then they most likely don't have the MS genuine approval for the free upgrade. Quote About 3 million computers get sold every year in China, but people don't pay for the software. Someday they will, though. As long as they are going to steal it, we want them to steal ours. They'll get sort of addicted, and then we'll somehow figure out how to collect sometime in the next decade. sarmad This chart means Linux is completely ignoring the Chinese market. It's more that the Chinese market is ignoring Linux. Because, as adamhm says, nobody's bothering that much about Microsoft's copyright over there. I'm not. And I did all of my gaming between about 2005 and 2015 on console. 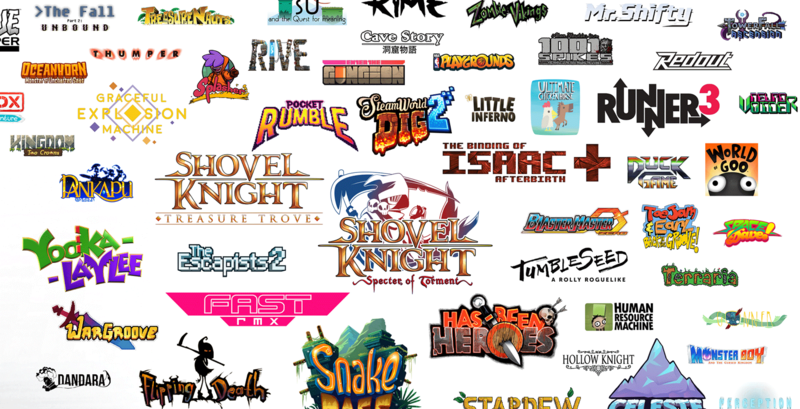 * Seriously, there are some titles I'd like to see on Linux, but it's not like I'm running short of games here. Maybe when I can pick one up second-hand for under 100GBP I might think about it, but not right now. Weird part is that they are paying for software (at least for games like pubg). Quote Weird part is that they are paying for software (at least for games like pubg). This speech is 20 years old. Now there are lots of well off Chinese who can pay for their OS and games. The most popular Steam games in China are Windows-only GTA V and PUBG, so even if there are millions of Linux users in China, they see no point joining Steam. Maybe if these games got Linux versions, we would see growth of Linux market share because of Chinese Linux users.